Star Seed featured on cover, with a six page chapter about Kate with images of other artworks. Making of Star Seed at EDC, Las Vegas 2013: video by Aric Gutnick. The KickStarter fundraising video in 2012. Artist Symposium Panel and Q&A: An informative and often funny panel with Zach Coffin, Dave X, and Caitie Magee: Advice on Burning your art, installing art publicly, managing a team, and the life of the artist at Burning Man. Your Art in Public Spaces: Advice on grant writing, installation negotiation and public art. Artist featured video at the Mysteryland Festival in Holland, 2014. A feature on the Altered State sculpture at Burning Man 2008, where the theme was The American Dream. Mars Transmitter Beta is installed at Edit Wharton's estate in Massachusetts as part of the Sculpture Now Exhibition 2016. Appearing minute 5:15. Why I Consider Burning Man the Greatest Cultural Movement of our Time - by Daniel Pinchbeck. One of the editorial's featured artists with Helios. This is an amazing essay about Burning Man art and culture. Hayes Valley San Fransisco features sculpture Future's Past: here. The Burning Man Civic Arts program features the Future's Past installation in Hayes Valley San Fransisco. 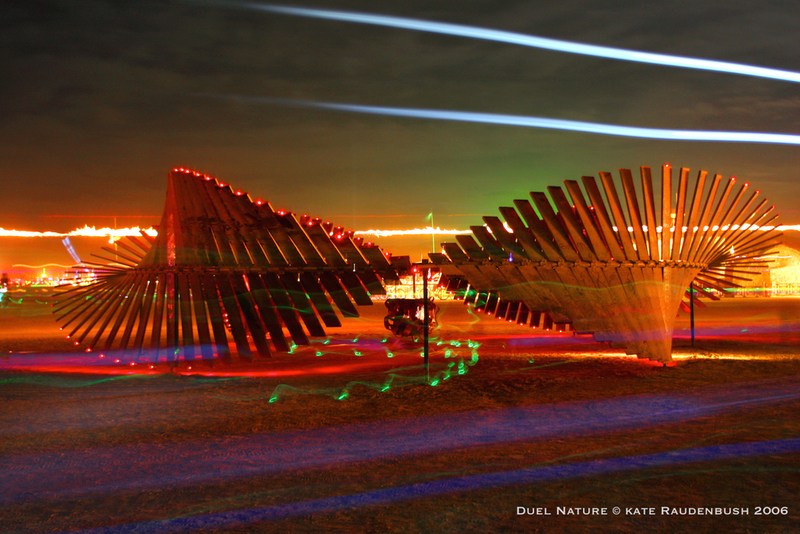 The Burning Man Civic Arts Program features Duel Nature installation in Downtown Reno, NV. Rolling Stone Magazine culture pages feature Star Seed at Burning Man 2012. Photo by Scott London. Nanotecture book features the sculpture Duel Nature.